Andrea Danková was born in Lučenec, Slovakia. She studied at the Conservatory in Žilina and at the Academy of Music in Bratislava. She’s laureate of several competitions and Prizes. She won the “Toti Dal Monte” competition and was subsequently invited to sing Micaela in Carmen at Teatro Comunale in Treviso under the baton of Peter Maag. Since her debut as Katia in the famous Katia Kabanova production directed by Robert Carsen at Teatro Real Madrid under the baton of Jiří Bělohlávek in 2008 and as Jenufa at Teatro Real Madrid under the baton of Ivor Bolton in 2009, she belongs to world's most acclaimed Janacek-interpreters. In the mean time she has interpreted Katia at Teatro Colon (Buenos Aires, 2010) at Opera National du Rhin, Strasbourg (Carsen production) and at Staatstheater Stuttgart (Jossi Wieler production) in 2012. More recently she made her debut at the Royal Theatre La Monnaie as Jenufa (title-role). 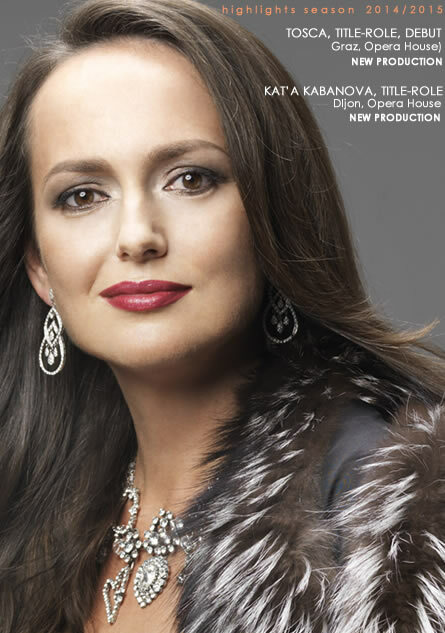 Season 2014/2015 Andrea Dankova sang her first Tosca at Theater Graz (nex production) and interpret Kat'a Kabanova at the Opera House of Dijon (new production). Her career’s most remarkable performances included Micaela in Carmen at Teatro La Fenice, Mimì in La Bohème at Opéra de Lyon (1997), concert performances of Micaela in Tokyo, Japan with Kent Nagano and Orchestre de L’Opera National de Lyon (1997), Liù in Turandot and Amelia Grimaldi in Simon Boccanegra with Daniele Gatti in Teatro Comunale di Bologna (1998), her successful US debut as Micaela and Liù at the Opera of San Francisco under the baton of Marco Armiliato (1998), her debut in the United Kingdom as Micaela and Desdemona in concert performances of Carmen and Otello with José Cura and Sir Colin Davis and the London Symphony Orchestra in London (1998, 1999). Her further most remarkable engagements also include Micaela at Teatro Real Madrid (1999), Violetta (La Traviata) in the new production of Franco Zeffirelli at Teatro Verdi in Busseto, and Teatro Comunale Ravenna (2002), concert performance of Julia in Dvořák’s Jacobin, with WDR Symphony Orchester Köln under the baton of Mr. Gerd Albrecht in 2003 (released on CD), La Bohème at the operahouses of Santander (2005) and Cordoba (2006), as well as engagements in some famous productions by Graham Wick as Woglinde in Das Rheingold (2006) and Ortlinde in Die Walküre (2007) at Teatro National de São Carlos in Lisbon. In May 2007, she made her debut at Teatro alla Scala as Jenufa where she had a big success. During her career she also appeared in numerous new productions of Slovak National Theatre including, among others, Mimì, Elena (Mefistofele, Mařenka (The Bartered Bride), Desdemona, Elvira, Luisa Miller, Micaela Violetta, Liu Amelia (Un ballo in Maschera). Further more she appeared as Mimi and Donna Elvira in Prague National Theatre. Her concert repertoire includes Janáček’s Glacolitic Mass (withSir Colin Davisand the London Symphony Orchestra in Barbican Hall, London and Avery Fischer Hall, Lincoln Center, New York; with Myung-Whun Chung and Bayerische Rundfunk in Munich; with Jiří Kout and Orchestra of Deutsche Oper Berlin, with Tomas Netopil in Teatro Maggio Fiorentino Firenze), Janáček’s Eternal Gospel, Dvořák’s Te Deum (with Sir Colin Davis and the London Symphony Orchestra in London and New York), Mahler’s 2nd Symphony (with Myung-Whun Chung and London Symphony Orchestra in London) and Dvořak’s Stabat Mater (in Musikverein Wien).